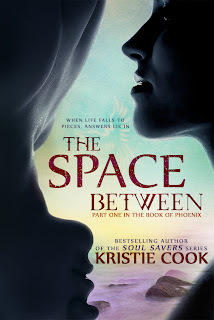 Today I'm excited to welcome one of my favorite authors, Kristie Cook, over to celebrate the release of her new adult paranormal novel, The Space Between. This book blew me away. You're going to love it! And, you're going to love Kristie. 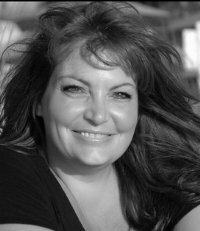 She's offering a $5 Amazon or B&N gift card to one person who reads this post and tells Kristie she dropped by my blog! To enter all you have to do is click on one of the options below on the Rafflecopter. And, Kristie is doing a MAJOR giveaway on her own site of a $200 gift card so be sure to drop by her site after you've read this and entered here. I hope you'll join me in welcoming Kristie. Kristie: Thank you, Heather, so much for participating in the release tour of The Space Between! And thank you, too, for being a beta reader! You asked me about my unique take on soul mates in this book and how I came up with it. I always giggle when people ask me about inspiration for my ideas, because the answer’s never easy. My ideas are usually the result of several things coming together. That’s what happened here. It started with the desire to make this new series, The Book of Phoenix, as different as possible from my first series, the Soul Savers. They both deal with souls and the ultimate connection between them, but, besides battles between good and evil, the similarities end there. In Soul Savers, the two main characters are soul mates—two souls that were created for each other. In the Book of Phoenix, I wanted a connection that was just as significant, but different. And I didn’t want to contradict myself either. I didn’t want to diminish the connection between Alexis and Tristan in the Soul Savers with this other series. So as writers do, I researched ideas for a similar connection between souls, and I discovered the concept of Twin Flames or twin souls—one soul that has been split in half. The idea goes back to Plato and more recently became part of the New Age Movement, started in part by Edgar Cayce. As I always do, however, I wanted to put my own spin on the idea. I also didn’t want to contradict my spiritual beliefs. Although it’s fiction, this remains important to me, so that was taken into account as I created my mythology. I already had some pieces in place before finding the idea of Twin Flames, but it fit in perfectly. So perfectly that I knew nothing else would work. I’d toyed with the idea of using only the “twin” part, researching twins and Gemini, but I didn’t want readers to get the idea that the love interests were actually twins. Ew! Then I noticed how much fire was already playing a major theme in my characters and the plot. Keeping “Flames” in the term was only natural. So the relationships between my characters in The Space Between are based on souls that have been split and each piece is constantly searching for its other half. But in my world, once they find each other, life gets a little…weird. And if they don’t find each other? It’s not good. At all. There’s so much more I could say about this idea and my spin on Twin Flames and soul mates, but I don’t want to give anything away. If it’s okay to say so myself, I think the concept in the book is really cool. I hope you’ll check out The Space Between to see what I mean. Enter to win a $5 Gift Certificate to either Amazon or B&N! So Thanks for this amazing chance to win. My birthday is in 16 days and I really hope that I win. This would be an awesome birthday gift to me. The concept sounds awesome! Thanks for sharing! Love fresh paranormal concepts. Best of luck, Kristie. That is a rave review. Definitely adding it to TBR. I find the Twin flames concept really intriguing. It seems to have such a history and now I want to learn more about it. This sounds like such an interesting and different (in a way) concept! And a great review! The concept sounds quite unique. Interesting post! Sounds like an awesome story to read, with irresistible romance at the center. It's wonderful to meet you, Kristie. The story sounds amazing! Thanks so much for sharing her with us, Heather.